You might remember my very personal post not too long ago that was written to my guinea pig that passed away a year ago. At the end of my letter to him I mentioned that I would light a candle that we bought in his memory. Buying a special candle to light in Patch’s memory was actually my mister’s idea and I thought it was very thoughtful of him to suggest it. A few weekends before, Nick and I browsed the candles in John Lewis and as soon as I spotted the Lily-Flame Candle in a Tin in Fairy Dust I knew it was the one, and that was before discovering that it smells divine. The candle is housed in a gold tin with the product information beautifully presented on pale pink labels. The branding is adorable and I love the name Fairy Dust. 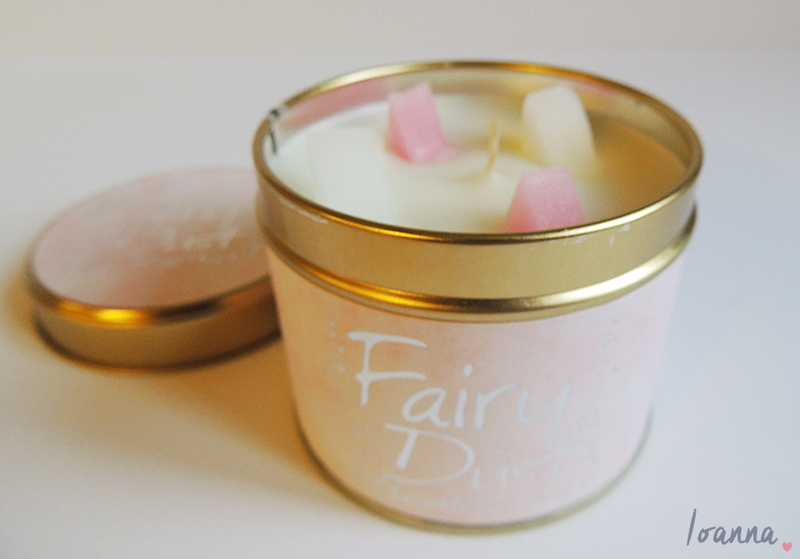 The candle is described as “Fairy Dust; Invisible & True. A difficult scent to describe; based on a fine fragrance, It’s Powdery, Warm, Sparkly and Magical.” Patch is no longer with us, but his memory always will be and therefore I think this candle is perfect for burning in his memory. As soon as I pulled the lid off the tin I was hit with a stunning aroma that is difficult to place. It’s a soft, powdery fragrance that reminds me of sweets and talcum powder. 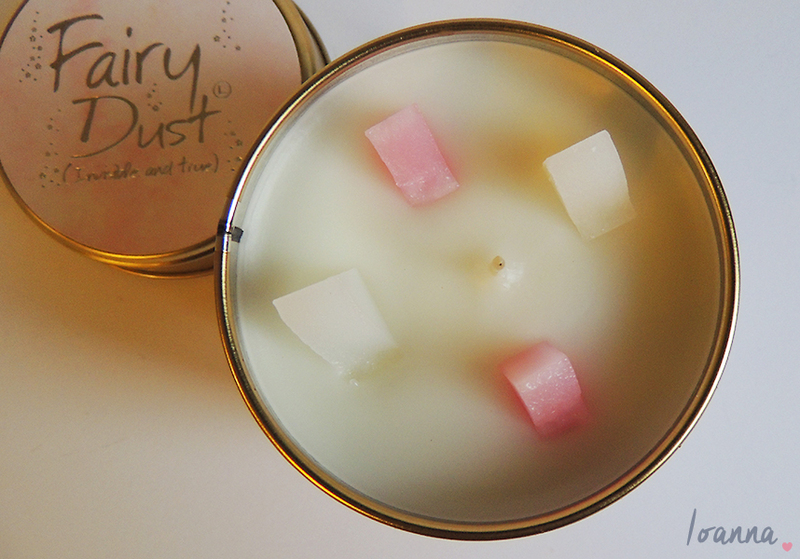 The pink and white wax chunks also remind of sweets and add to the magic of the candle. When lit the scent fills the room, it’s strong but not too overpowering which is what I like in a candle. 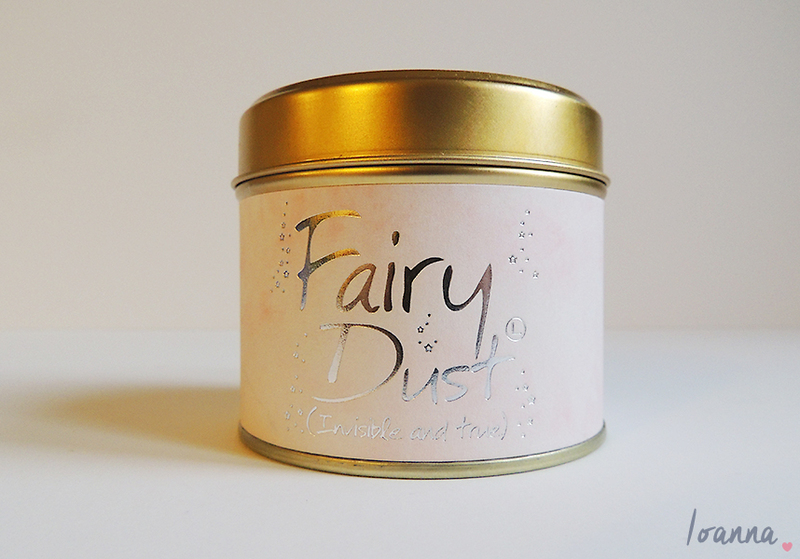 Fairy Dust costs £8.50 which is more than I’ve ever spent on an individual candle but I’m very impressed by the quality and it has a burn time of 35 hours. I’d love to try more Lily-Flame Candles in the future. Have you tried any Lily-Flame Candles? Which would you recommend?